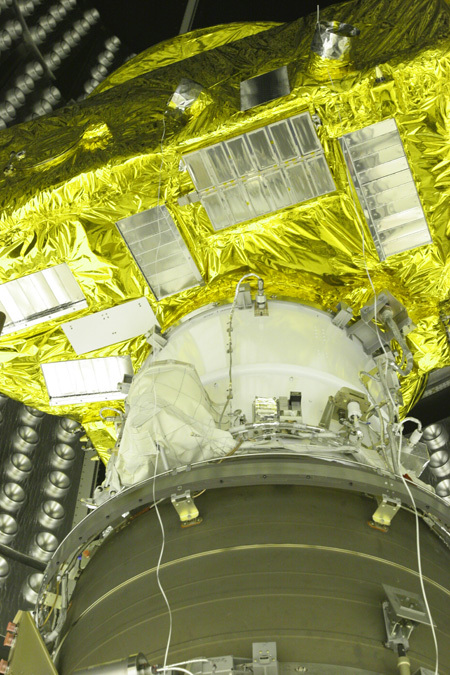 The Student Dust Counter instrument is clearly visible on the deck of New Horizons in this image, taken as the spacecraft was being encapsulated in the fairing of its Atlas V launch vehicle in December 2005 at Kennedy Space Center, Fla. The detector segment of the instrument, mounted below the pair of protruding star-tracking cameras, has 12 individual rectangular cells. An electronics box inside the craft determines the mass and speed of the space-dust particles that hit the detector.